Looking for a spacious, compact tackle bag to easily transport your fishing gear? I have been using the new 360 Pro Molle Tackle Bag from Field & Stream and find it to be a quality, compact tackle bag. The bag features a padded main compartment which includes three plastic organizers. Depending on your personal preference, additional organizers can be purchased as needed. The bag features spacious, zippered side and front pockets, perfect for storing tackle and lures. It has molle holes on the front, making it easy to store accessories on the exterior of the bag. This helps to free up more storage space on the interior of the bag. I particularly enjoy the plier holder on the front of the bag. It securely fastens my pliers and makes them easily accessible. The elevated base keeps your gear out of the water and your items dry on the inside. In addition the bag is comfortable to transport because of the padded shoulder strap. Overall, I found the tackle bag to be great for short outings. It is small, yet spacious enough for a day out on my kayak. Despite having a lower price tag, this bag is made of durable materials and built to last. The 360 Pro Molle Tackle Bag is reasonably priced at $49.99, given some name brands are nearly $100.00. 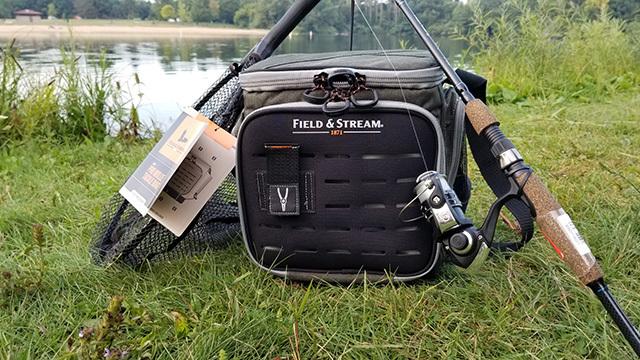 If you are interested in this product but would like more room for your gear, Field & Stream also offers a larger version called the Pro Molle 370 tackle bag that is 14 ½ inches wide, 14 inches high and 10 inches deep.